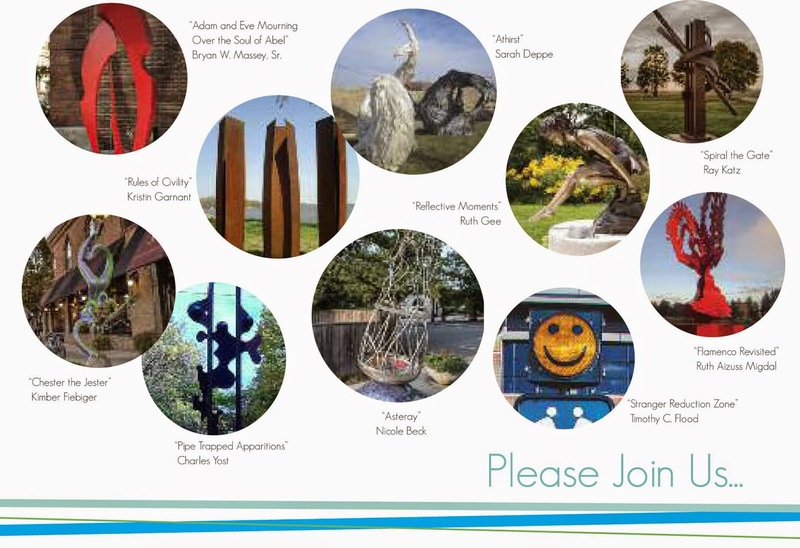 On the evening of Tuesday, December 8, 2015, please join us to celebrate the installation of the new sculptures in the Champaign-Urbana area (including Mahomet) over the past year. The event will take place at Biaggi's (2235 S. Neil St. in Champaign) on Tuesday, December 8th from 5:30 - 7:30pm. Appetizers and a cash bar will be available. Please RSVP by Friday, December 8 here if you plan to attend. If you have any questions, please feel free to email us. Join us for a night of food, drink and friends of the Public Art League as we celebrate the new sculptures and their sponsors! The Public Art League is pleased to welcome "Triumph" by Benjamin Pierce (Cape Girardeau, MO) to the breezeway of the M2 Building in downtown Champaign. 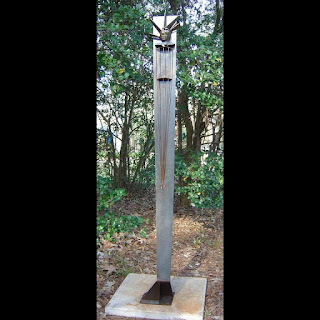 The sculpture was constructed from welded steel and stands 9' tall. "Triumph" is the most recent sculpture for Pierce within a series of work titled "balance." In the series, the artist tries to focus on form and material more than ever. The center oculus captures space and creates a window for the viewer to look through. The artist states: "We live in a society that has forgotten how to enjoy our surroundings, with our faces always in a laptop or a smart phone it's difficult to be able to stop and smell the roses. My hope for this work is to capture someone's attention long enough for them to see something unexpected through my sculpture." 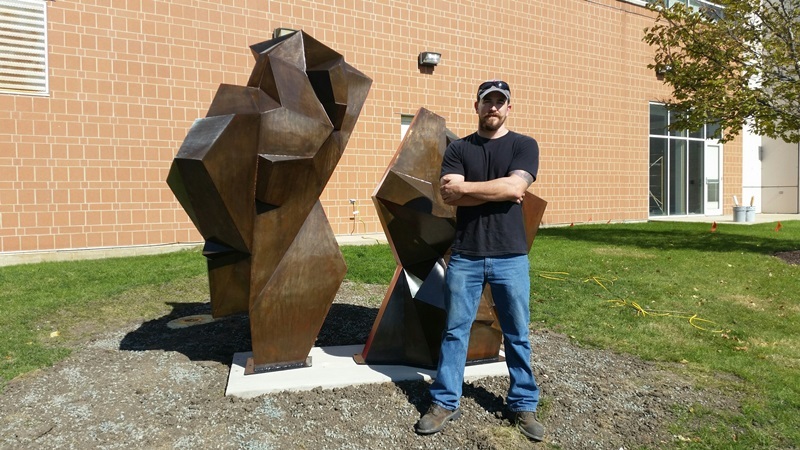 The Public Art League would like to thank Councilmember Marci Dodds, Cody Sokolski, and One Main Development for the site sponsorship of this piece. 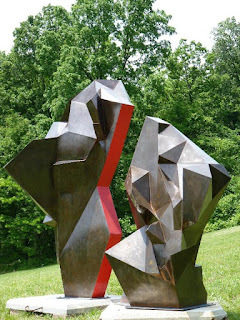 The Research Park Welcomes "Separated Together"
The Public Art League is pleased to welcome "Separated Together" by Benjamin Pierce (Cape Girardeau, MO) to the corner of Oak Street and Hazelwood Drive (in the University of Illinois Research Park) in Champaign. The sculpture was purchased by the University of Illinois Research Park and can be enjoyed for years to come at the site. Of the sculpture, the artist states: "Utilizing the gap or the idea of missing space or something removed encourages thought, not just on form and composition but treatment of negative space. I have taken what seems to have been one form and taken something from it or pulled it apart. The transformation of two things or shapes into something else, beyond what is there but also what is NOT there." A big thanks to the University of Illinois Research Park for supporting public art in our community! The Public Art League welcomes two pieces by Carl Billingsley (Ayden, NC) to Champaign. 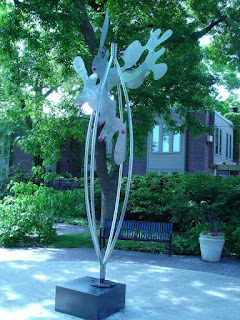 "Prism Arc-Top Disc" was installed in the wedged landscape area where Chester Street splits from University Avenue (by the Illinois Terminal). 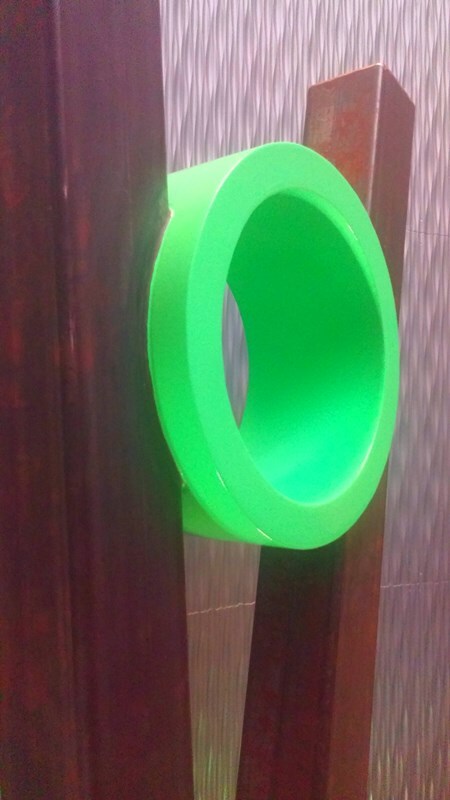 The sculpture is one of a series of sculptures by Billingsley that are based on color theory. Each sculpture in the series is designed so that the colors change as the view point and angle of light change. Reflected color is utilized to 'fool the eye' as red seems to be orange, yellow turns into green and so on. The sculpture was brought to the site with the help of a generous donation from Barak Rosenshine. 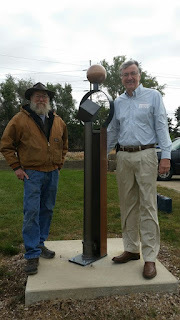 The sculpture was installed with assistance from the City of Champaign. "Platonic Solids" (pictured below) was installed by the artist at the top of the hill at the southeast corner of Neil Street and Stadium Drive. "Platonic Solids" is a classically balanced vertical composition that references the Platonic Solids of Greek mathematical thought. Plato was known for speaking his mind in public as well as for his innovative ideas about philosophy and science. "Platonic Solids" is an opportunity for the public to consider such ideas in the contemporary context of the public street. 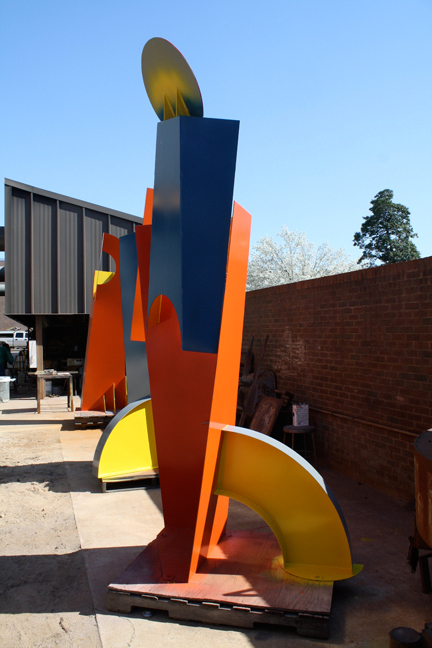 The sculpture was brought to the site with the help of a generous donation from MCDJ, LLC. 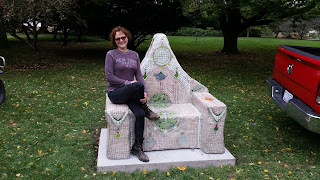 The Champaign County Forest Preserve District (CCFPD) is pleased to welcome "Throne Rococo Nouveau" by Suzy Hendrix (Memphis, TN) to the Mabery Gelvin Botanical Garden at Lake of the Woods Forest Preserve in Mahomet. The sculpture is part of the Public Art League's 2015 sculpture program. Artist Suzy Hendrix states that she creates works of art that allow the public to interact with them. Even though most art is to be looked at but not touched, people are encouraged to sit in the "Throne Rococo Nouveau." 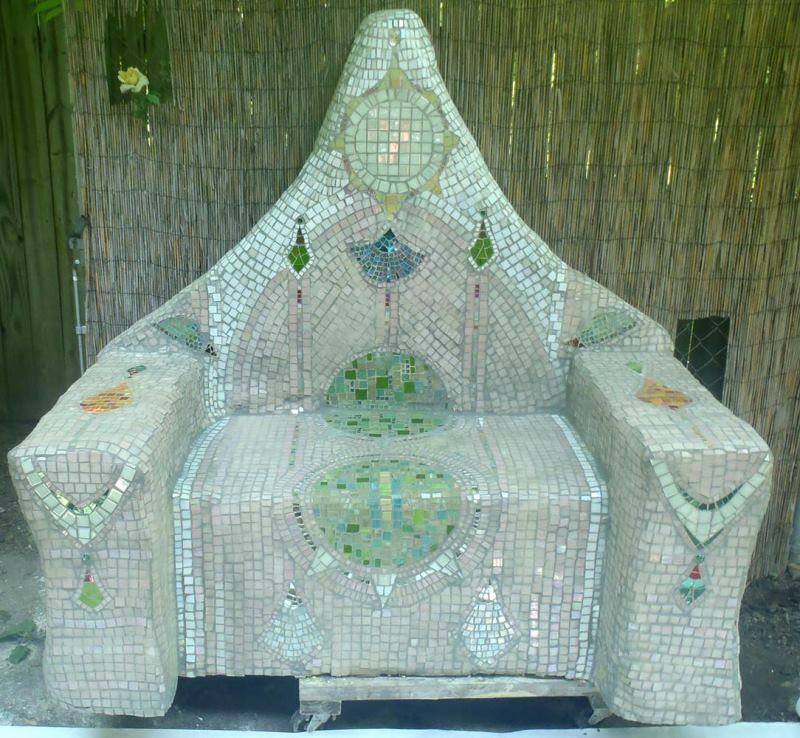 "Throne Rococo Nouveau" stands 57" x 59" and is constructed of concrete, fiberglass, steel rebar on Styrofoam, and covered in multi-colored mosaic tiles. Her inspiration for the piece came from the images of the ruins of Pompeii. 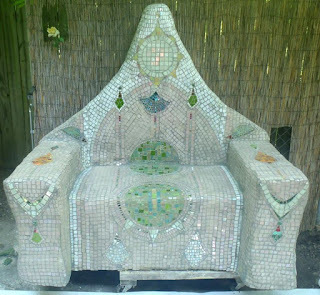 The piece took over a year for the artist to complete, as she worked on it in her back yard during free time from other projects. "Throne Rococo Nouveau" will be on display for two years in the Mabery Gelvin Botanical Garden thanks to a generous donation from Rosann Noel in memory of her mother, Mabery D. Gelvin, to whom the garden is dedicated. "The vision for the Garden has always been to provide unique visitor experiences in a naturalized setting, for all to enjoy. This piece is now part of that tradition that we hope will continue into the future with additional pieces," said Daniel Olson, Executive Director of the Champaign County Forest Preserve District. 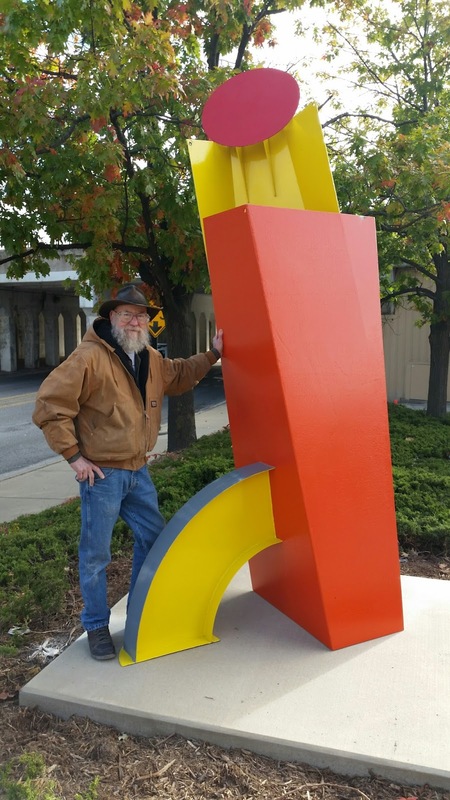 Dan Noel, President of the Forest Preserve Friends Foundation, was familiar with the mission of the Public art League (PAL), and knew the program was a good fit for the CCFPD's vision. "We knew the CCFPD was looking for ways to enhance the Garden, and knew that PAL's program makes it easy for agencies to get involved with public art. Our Foundation brought the groups together and sought donations for the lease of the artwork," said Dan Noel. 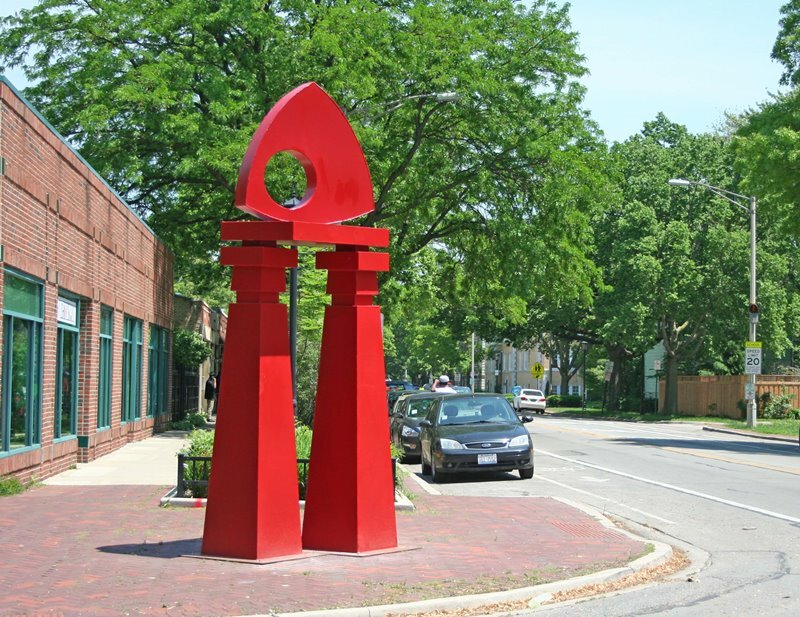 PAL is a not-for-profit organization that focuses on the installation and promotion of public artworks in the Champaign-Urbana area. PAL works with entities such as the CCFPD to bring art to public areas. Eric Robeson, Charter PAL board member stated, "We are very pleased to bring the first PAL artwork to the Champaign County Forest Preserve District and into Mahomet." 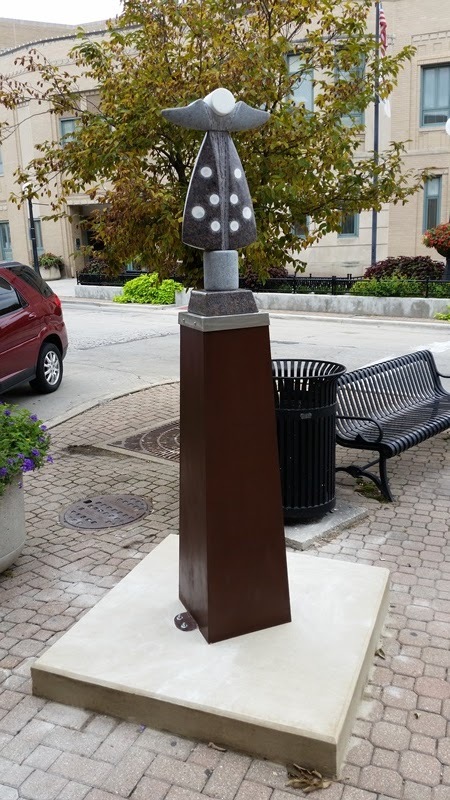 The Public Art League is pleased to welcome "Eye of Uxmal" by James K. Johnson (Charleston, IL) to Champaign. The sculpture was installed on Sept. 11, 2015 at the corner of First St. and St. Mary's Road (by the iHotel). 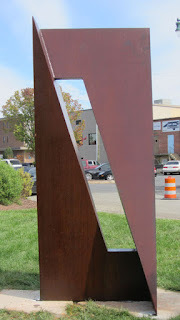 "Eye of Uxmal" stands 14' tall and is constructed of Cor-Ten steel. James K. Johnson states that he is interested in creating works of art that cause the viewer to become aware of their surroundings while reflecting upon past experiences that have shaped their personal and private lives. A big thank you to Fox/Atkins Development, LLC for the site sponsorship of this piece. 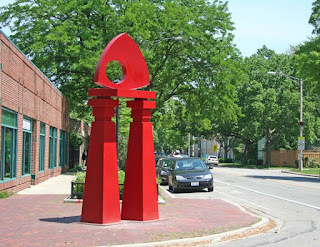 The Public Art League welcomes "Dakota Memories" near the corner of Chester and Neil Streets in downtown Champaign. 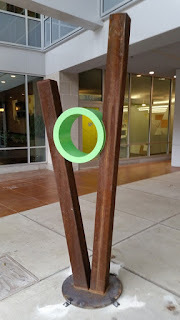 The sculpture is installed near Quality (bar) across the street from the City Building. 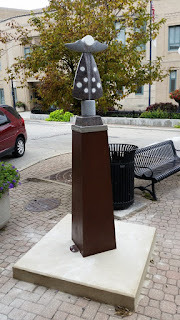 "Dakota Memories" is the second sculpture by artist Shawn Morin in downtown Champaign through the Public Art League program and is constructed of Mount Rushmore granite, marble and steel. 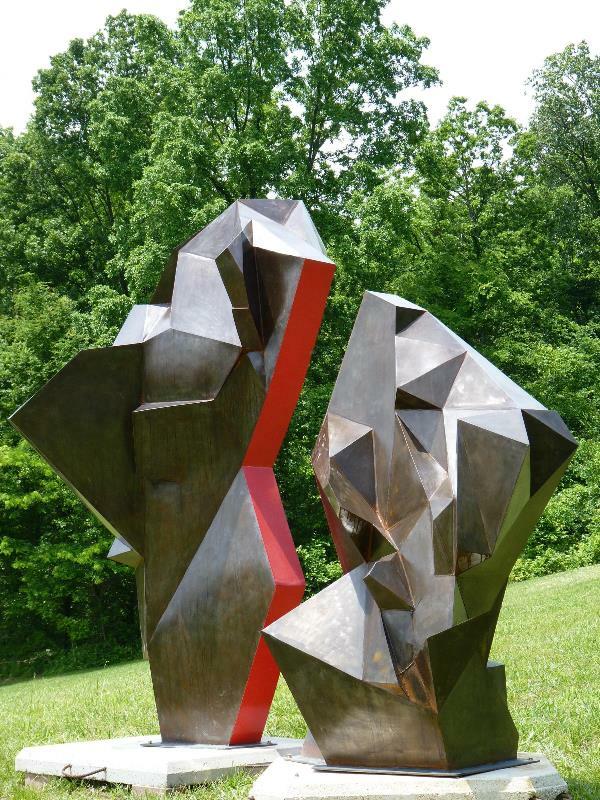 Morin's other sculpture, "Remembering Horeb," is installed nearby. "Dakota Memories" is the 51st sculpture installed by PAL since 2010. Thank you to the "Friends of PAL" for bringing it to the community. 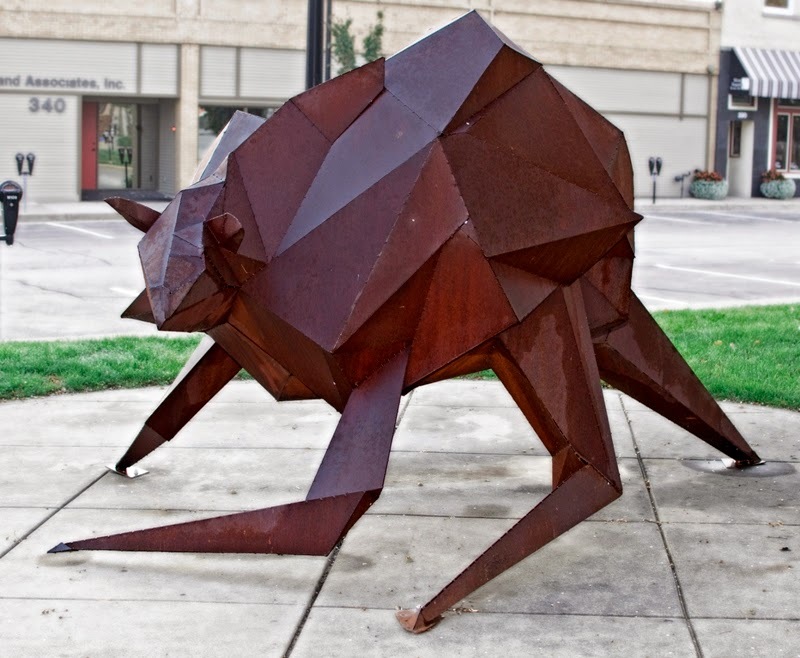 The Public Art League is pleased to introduce the sculptures that might make their way to the Champaign-Urbana area in 2015. The following sculptures were recommended by our advisory jury panel and unveiled at our public unveiling event earlier this summer. 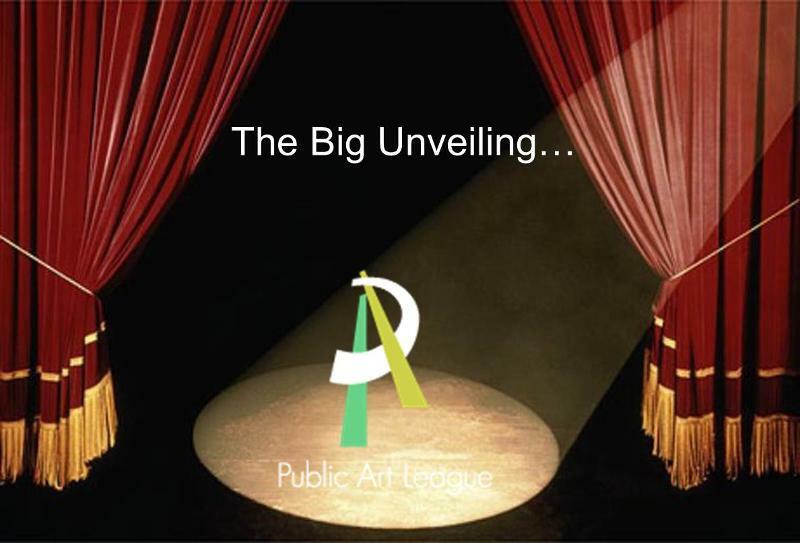 The Public Art League is now seeking site sponsors who will make it possible to bring the sculptures to the community. A number of sites have already been sponsored, but a number of sponsorship still remain available. If you are interested in learning how you, your business or organization can become a site sponsor, please contact us. "Bipolar Apparition Attack - Formus Interrupius"
Height 57", Width 59", Depth 37"
Thank you to all of the wonderful artists who submitted artwork for this year! 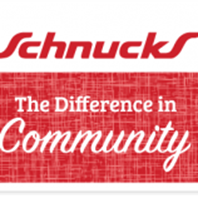 Join us Tuesday, June 23rd from 5:30-7:00p.m. at Biaggi's Ristorante Italiano as we unveil the sculptures that could make their way to the Champaign-Urbana area this year! Artists from all over the country have submitted their entries and you will get a chance to see the wonderful pieces that have been selected for installation. Join us on Wednesday, April 8 at Art Mart in the Lincoln Square Mall in Urbana for a wine tasting to benefit The Public Art League. The event will take place from 4:00 p.m. - 7:00 p.m. Feel Free to stop by any time during the event to taste the delicious wines. Entry will be $20 per person and is payable at the door. There will be special discounts for wines ordered at the event and a portion of the event's wine sales will be donated to PAL. We hope you can join us for this exciting evening! 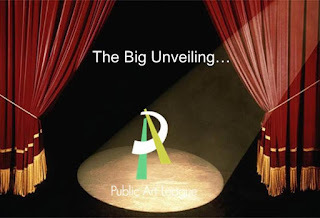 The Public Art League (PAL) is pleased to announce our 2015 Call to Artists. 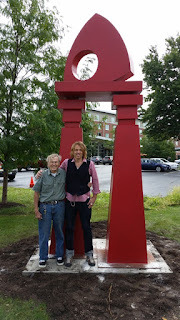 PAL is a 501(c)(3) charitable organization whose focus is the installation, maintenance and promotion of public artworks in Champaign-Urbana, Illinois. Our mission is to promote creativity and improve our community's aesthetic by cultivating awareness and appreciation of public art. Please follow the link below for information regarding the 2015 Call to Artists and to access a "Sculpture Exhibition Entry Form."